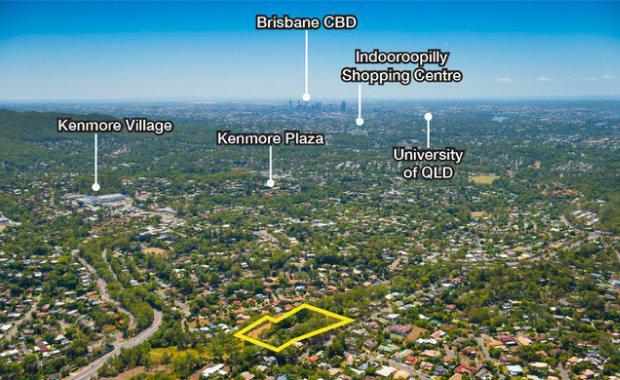 An approved residential development site at Kenmore in Brisbane’s west is being offered for sale via auction by Ray White Special Projects (Qld) and Brisbane Real Estate. The elevated site which offers expansive views currently sits on two titles and it has an existing Development Approval for 11 residential lots. It is to be auctioned as one parcel. The 1.496 hectare site with an architecturally-designed existing residence at 29-31 Gem Road, Kenmore, is being marketed by Andrew Burke and Matthew Fritzsche of Ray White Special Projects and Fyri Fahir of Brisbane Real Estate. “Although there is an existing approval in place for an 11 lot subdivision (with existing residence on its own lot), the site has a range of development options,” Mr Burke said. Mr Fritzsche said the property is currently zoned ‘Emerging Communities’ under the Brisbane City Plan. “Kenmore is a well-established suburb which also holds appeal to both the owner occupier and investment market due to underlying house price growth, strong rental fundamentals, and location attributes.” he said. Mr Fahir said the Gem Rd property is central to a range of amenity and community infrastructure, including local neighbourhood and major shopping centres; Kenmore Plaza and Kenmore Village Shopping Centre. “The property currently features an architect designed, two-storey, four bedroom house with study or fifth bedroom, four bathrooms, large rumpus room, views, pool and a full size tennis court,” he said. “The home is centrally located in Kenmore which has public and private schools and childcare facilities as well as local parks, bike and walkways and recreation areas. The property will be auctioned on-site at 11am (AEST) on Friday, 15 September 2017.